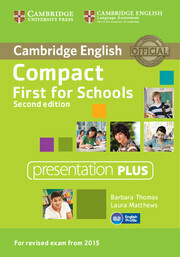 The Digital Complete First integrates the Student's Book, class audio and answers allowing teachers to add their own resources, comments or links to their digital copy of the book. It also contains comprehensive notes, as well as extra activities and classroom ideas to inspire both teacher and students. Complete First Spanish edition caters to the needs of the Spanish teacher providing integrated notes on the extra pronunciation activites, the social awareness content and the extra spelling, vocabulary and grammar practice as well as on the new tests.